For those of you that follow my blog closely, you may remember in December 2015 I did two reviews on two different books written about “The Beatles vs. The Stones.” In both reviews, I expressed the opinion that I think it’s ridiculous to compare the two bands at all. But still, writers and on-air personalities can’t seem to let it be. 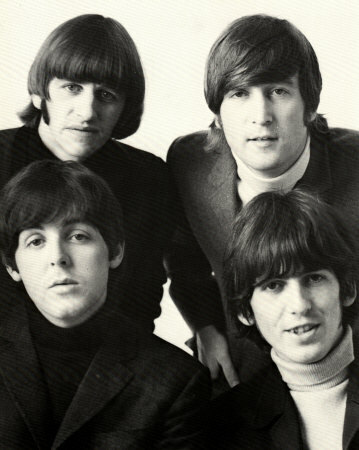 Every year there are hundreds of radio stations that hold listener polls, and millions of Beatles, Stones and Zeppelin fans rush to their phones and computers to prove their favorite band is better than all the rest. And so, here is my response to all this nonsense. I told my husband that some day I would write this blog to show the silliness behind comparing artists. Back in 1987, I bought a copy of Barry Manilow‘s autobiography – Sweet Life: Adventures On The Way To Paradise . I loved this book then and I love this book now. In fact, I will admit for the first time publicly …I’m a FANILOW! Phew…I’m finally out of the closet. Barry Alan Pincus was born June 17, 1943 in Brooklyn, NY. Soon after his parents, Edna Manilow and Harold Kelliher were married, Barry’s father was drafted into the army, forcing his mother to move in with her domineering mother Esther and docile grandfather Joseph Manilow. His father was not present for his birth. John Winston Lennon was born October 9, 1940 in Liverpook, UK. John’s father, Alfred Lennon was a merchant seaman who was away most of the time but would send his checks to Julia who was living with her father at the time. Alfred would not be present for his son’s birth. Upon the birth of John, his Aunt Mimi would be the first to rush to the hospital to see her new nephew. Soon after his father’s return from the Army, Barry’s parents would divorce. Barry and his mother would continue to live with her parents. His Gramma was a bitter and frustrated woman, who poured all her love into Barry. Barry changed his name to Manilow. Harold was banned from seeing his son Barry. After returning from sea, Alfred Lennon would find his lonely wife living with another man, but refused to divorce her. Aunt Mimi believing this was not the right environment to raise a young child, took John in to live with her and her husband George Smith. At age 11, while walking home from school, a Schaefer beer truck pulled up next to him. It was Barry’s father. After introducing himself, he handed Barry a tape recorder for his birthday, gave him a hug and a kiss and drove off. Barry would never see him again. At age 5, Alfred Lennon showed up at Mimi’s offering to take John on a long holiday. When it was found out that his real intentions were to migrate to New Zealand, Julia found them, recovered John and promptly took him back to live with Aunt Mimi. Alfred was banned from seeing John again. Barry’s parents bought him a piano in his early teenage years. By his sophomore year, he formed a band with is friends Larry and Fred on clarinet and vocals, Rosario on trumpet and Harry on drums. Barry wrote arrangements and played piano. With a guitar bought for him by his Aunt Mimi, John started a skiffle band when he was 15. Lennon and Eric Griffiths played guitars, and Pete Shotton and Bill Smith on washboard and tea chest bass. Barry married his high school sweetheart, Susan Deixler in 1964. The marriage last 1 year. John married his college sweetheart, Cynthia Powell in 1962. The marriage lasted 6 years. Barry Manilow hated the sound of his own singing voice. John Lennon hated the sound of his own singing voice. In 1971, Barry started using Primal Scream therapy to deal with his being too uptight. John Lennon and Yoko Ono started using Primal Scream therapy in 1970. Barry Manilow and Bette Midler taped joints to the bottom of the seats of the Philharmonic Hall until an usher snitched at the last minute. They were to be the climax of the evening’s New Year’s Eve show for 1973. John Lennon and Yoko Ono were busted for marijuana possession on October 28, 1968 in London, when the police brought drug sniffing dogs into their apartment and found 1.7 grams of cannabis in an envelope and another 12 grams in a binocular case. John Lennon would have his first Billboard #1, Whatever Gets You Through the Night, on October 28, 1974. Barry Manilow married his longtime manager Garry Kief in April 2014 after 35 years together. In 1978, five of Barry Manilow’s albums were on the best-seller charts simultaneously. The week of April 4, 1964, the Beatles ranked at Nos. 1-5 with “Can’t Buy Me Love,” “Twist and Shout,” “She Loves You,” “I Want to Hold Your Hand” and “Please Please Me,” respectively. Well, I could continue on with this historical comparison, but I won’t. I could even place a poll at the end of this post to see which musician, Lennon or Manilow, is really the favorite among my readers, but would that really be fair? No, because my readers are Beatles fans, John Lennon’s career was cut short by his murder and Barry Manilow lives on to create music and entertain the masses. The unused ticket at the bottom of my post is mine from 1988. I missed seeing Barry then, but still hope to see him someday. But time is running out for me!